Romualdez asked yesterday the public to remain vigilant in reporting to authorities all sightings of “revelry spoilers” or violators of regulations on the use of firecrackers and firearms during the welcoming of New Year. Romualdez made the statement after at least six persons were hit by stray bullets across the country as of Sunday, based on the latest tally made by the Philippine National Police (PNP) National Operations Center. “Let us bring to the attention of authorities sighting of revelry spoilers. 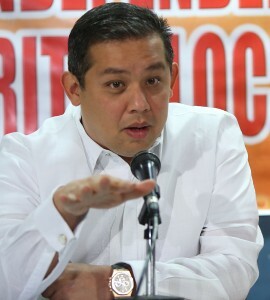 The public should not allow individuals or groups to light prohibited fireworks, fire their guns and burn old tires,” Romualdez added, as he recalled that most fires during New Year’s celebration were firecracker-related. The PNP reported that three individuals sustained injuries from stray bullets in Calabarzon region, two in Metro Manila, and one in Central Visayas region. Last December 22, Deputy Director General Leonardo Espina, PNP officer-in-charge, ordered all PNP personnel to seal with masking tape the muzzles of their firearms to prevent indiscriminate firing incidents and vowed to identify those who will violate. Romualdez also asked the public to greet the New Year filled with love and happiness instead of being caught in a heartbreaking situation for not following the strict orders from authorities to avoid dangerous firecrackers. Romualdez stressed, adding the public can call the national police hotline for immediate response and possible arrest of revelry spoilers. He said the public should instead greet the New Year in the company of their loved ones instead of going to hospitals or other places not fit for holidays. “It’s better to be safe than sorry. We have to work in ensuring public safety during the year-end celebration,” said Romualdez. He appealed to gun holders, including members of the PNP not to mark the turn of the year through indiscriminate firing. “Let us preserve human lives as well as properties as we bid goodbye to 2014 and welcome the 2015,” said Romualdez.